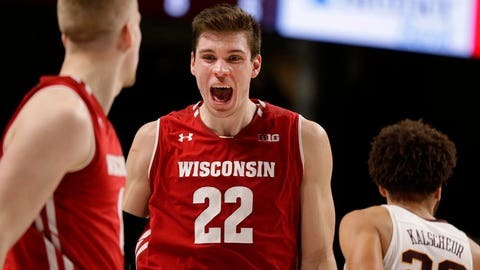 After a one-year absence from the NCAA tournament, the Wisconsin Badgers are going dancing again. Wisconsin was given a five seed in the South region, officially announced on the Selection Sunday show. They’ll play the 12th-seeded Oregon Ducks on Friday in San Jose, Calif.
Oregon (23-12, 10-8) had just 15 victories on its resume Feb. 23, but the Ducks head into the tournament on an eight-game winning streak. The Ducks won all four games in the Pac-12 tournament, including a 68-48 victory over top-seeded Washington on Saturday night to clinch the conference title and automatic bid. The Badgers hope this is the beginning of a new tournament streak, as Wisconsin made 19 straight tourney appearances from 1999-2017.